Now it's time to fit and glue the top. 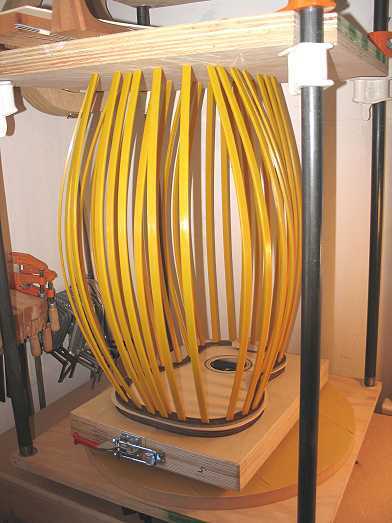 Here I have the top clamped onto the side set, with the centerlines at the neck and tail matched up. I mark where the braces (the two x-braces and the upper face brace) meet the outside of the side, marking both underneath the brace and at both sides of the brace. 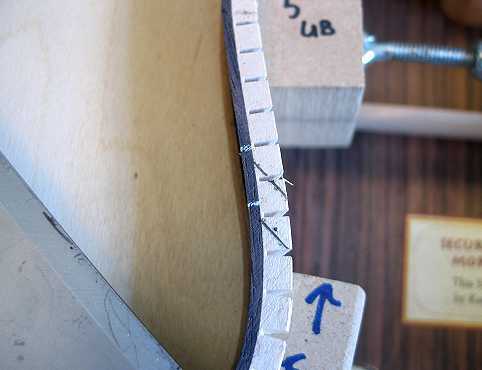 That will tell me where I need to cut off the end of the brace (3/32" in from that mark, so the brace will end right at the inside of the side). 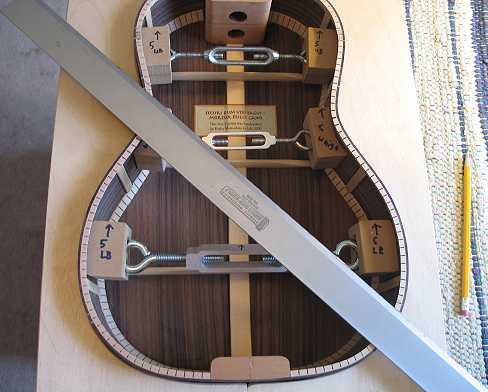 It will also tell me where to cut the pockets in the kerfing. Then, with a 24" straightedge, I mark where those braces cross the kerfing. I use a razor saw to cut on those penciled lines, and then I use a 1/4" chisel to make the pocket for the brace to sit in. My brace ends are 1/8" tall, so that's how deep I make the pocket. I check the fit of the top to the side set, and it fits well. This time I have no play, side to side. I must be getting better at this! 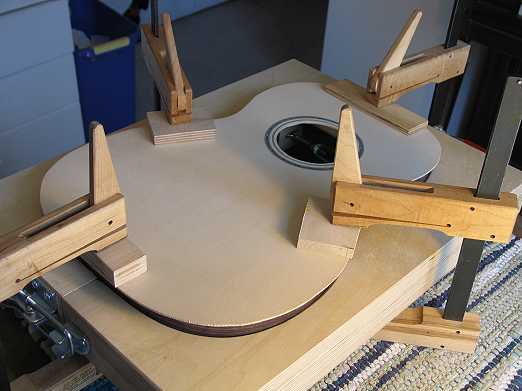 I put glue on the kerfing and blocks, lay the top onto the sides, and use the go-bar sticks to clamp it down (on top of the guitar-shaped clamping caul, of course). In a few hours, I'll finally have my soundbox!!! !